Katy Perry in Manila 2018 ~ What's New Philippines? Katy Perry is coming back to Manila as part of her WITNESS: The Tour which will be held at the Mall of Asia Arena this April 2, 2018. The WITNESS: The Tour is the fourth musical tour of the singer American Katy Perry, held to support of her fifth studio album, Witness (2017). It's also her fourth time in the Philippines. Katheryn Elizabeth "Katy" Hudson, better known by her stage name Katy Perry, is a American singer, songwriter and guitarist. 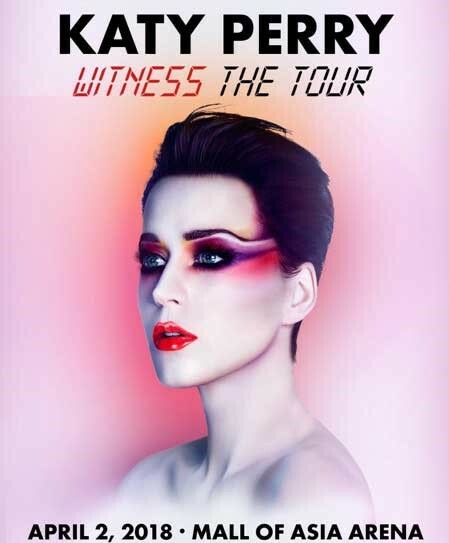 Tickets available starting 11 December, 12 noon onwards via KatyPerry.com and SM Ticket Outlets.